Any young lady would love to shop at Claire’s! And the great news is, you can purchase a discounted Claire’s gift card and save money on your entire purchase! That’s right, everything you buy will cost you less money! What’s more, you can use your card at over 3,400 locations worldwide and at any time. Which means you can shop once while on vacation, and again at your local store, and use the same card each time! And don’t forget, gift cards make fantastic presents too! Why not give the gift of shopping to that special young lady in your life? And just think, you’ll actually pay less for the very same merchandise! Remember, we’re not just talking about your average store here. Because this store is any young lady’s dream! With endless varieties of jewelry, hair accessories, holiday gear, beauty items, stuffed animals, tech gear and more, she’ll be in heaven. We all know this is the go-to place for ear piercing! In fact, they’ve performed over 94 million piercings worldwide? And just think, with your discounted Claire’s gift card, you can save money on your entire shopping trip! And that’s not all! Because gift cards are a form of currency, all store coupons, promotions and offers are valid. This is great news because they have lots of great deals, such as buy three get three free. Now, Just think of the fun she’ll have shopping and the fun you’ll have when you pay less! Because they are recognized worldwide, they have also become a standard feature of nearly every mall. And for good reason. They have something for nearly every young lady. 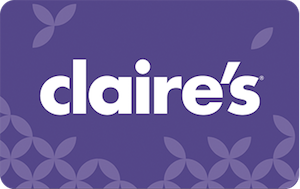 Now just think, you can purchase a discounted Claire’s gift card and save money on everything they carry. This means jewelry, stuffed animals, handbags, and much more, for less money! Any young lady would be thrilled to shop in this store, and you’ll be delighted by the money you’ll save! When you buy your Claire’s gift card from Cards2Cash, you’ll receive the best value for your money. But that’s not all we offer! We also carry discounted gift cards for many popular restaurants, websites, and retail shops. We understand how hard it can be to live within a budget and we work to save you money in as many ways as possible! For more money saving options, be sure to check out our listings for Charming Charlie, J.C. Penney, Target, and more! With Cards2Cash, you can get the most from your money! Do you have a Claire’s gift card that you aren’t going to use? Sell it to Cards2Cash, and we’ll turn that unwanted card into money! We pay the highest possible price for gift cards! If interested, visit one of our retail locations, and we’ll pay you on the spot, OR you may fill out our easy online form, and we’ll get back to you quickly with an offer for your card. Whether you want to buy a gift card or sell one, Cards2Cash has you covered!